Update: Nov. 8, 2017, 3:26 p.m. The College of Arts and Sciences released a statement to The Statesman saying that they informed Sarah Azzara and two other faculty members that they would be reassigned on Oct. 20. Azzara said she was only told her contract would be renewed, and has yet to receive a contract or any written confirmation of the renewal. Sitting in her office on the second floor of the Humanities Building, Becky Goldberg, an adjunct professor in the Program in Writing and Rhetoric, contemplates what the future will hold for her family when her contract with Stony Brook University expires at the end of this semester. Goldberg and her husband, Chris Petty, are two of the 20 professors in the Program in Writing and Rhetoric who were told that their contracts would not be renewed next semester. The affected faculty were given notice in the second week of October. Program director Roger Thompson called them in for a meeting, in which he explained that there was no adjunct budget for the spring and that all of them would have to be let go. Two full-time lecturers, including professor Sarah Azzara, were also told they had been let go. Yet, with class sections still assigned to them on SOLAR, it is uncertain whether that decision has been finalized. For Azzara, losing her job means losing a hard-fought sense of security for her and her 11-year-old daughter, Madeline. “The timing of it was horrible,” said Anthony Teets, another non-renewed adjunct. Since the application process for most spring teaching positions begins at the start of the fall semester, Teets and many of his colleagues have no set plans for where they will land next. For many of the professors who are not being renewed, the thing that concerns them the most is what will become of their program once they are gone. 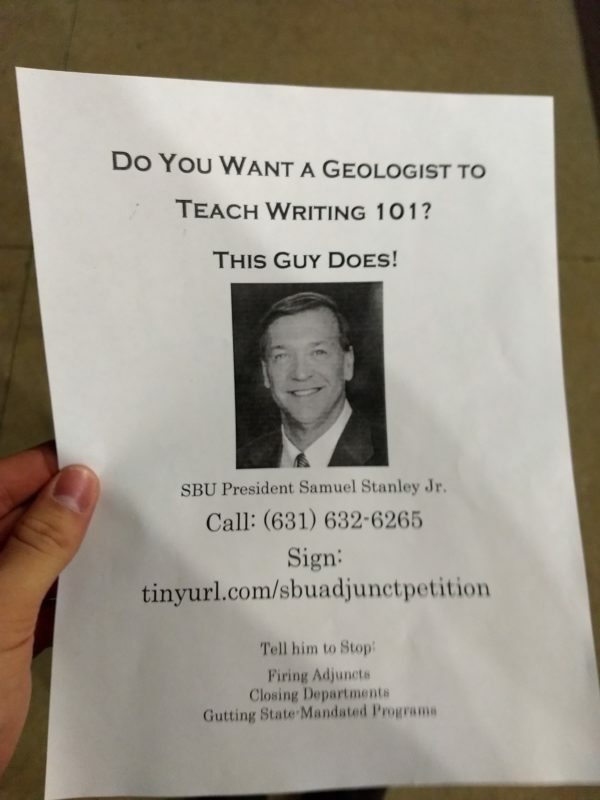 In order to fill the demand for courses like the Intermediate Writing Workshop (WRT 102), which most students must complete, the adjuncts were told that full-time lecturers from other disciplines, including pharmacology and geology, would take their places. There will also likely be an increase in class sizes, as President Samuel L. Stanley Jr. confirmed at a press conference with student media last week. The number of upper division course sections for students enrolled in both the writing minor and the professional writing minor will be decreased from 20 to five. Azzara took issue with the notion that faculty from other departments could or should teach writing. With increased class sizes and professors who may be more accustomed to teaching in large lecture halls, Goldberg said the personal connection that the faculty has worked so hard to create in their introductory courses could be lost. At a town hall meeting last Thursday, Dean of the College of Arts and Sciences Sacha Kopp said the decision to bring in full-time faculty from unrelated departments was made in an attempt to save other lecturers who were at risk of termination. Teets, who has been at Stony Brook for six years, fired back at the suggestion that adjuncts do not contribute to the university at the same caliber as their full-time counterparts. “Last year I received the President’s Award for Excellence in Teaching. And this year it’s ‘hit the road jack.’ I don’t get it,” he said at the meeting. The faculty demonstrated their sense of confusion and betrayal via twitter after Kopp posted a picture featuring two of the non-renewed professors, praising them for their work in the department. One of the professors pictured, adjunct Steven Dube, tweeted back asking for a response from the dean, but his request was never fulfilled. As a last ditch effort to save their jobs, the professors have organized a protest and a petition calling on the College of Arts and Sciences to reverse the decision. As the professors try to preserve a sense of normalcy in their classes, behind closed doors, Goldberg said there is an unmistakable feeling of despair. Mike Adams, Gary Ghayrat and Brianne Ledda contributed reporting.